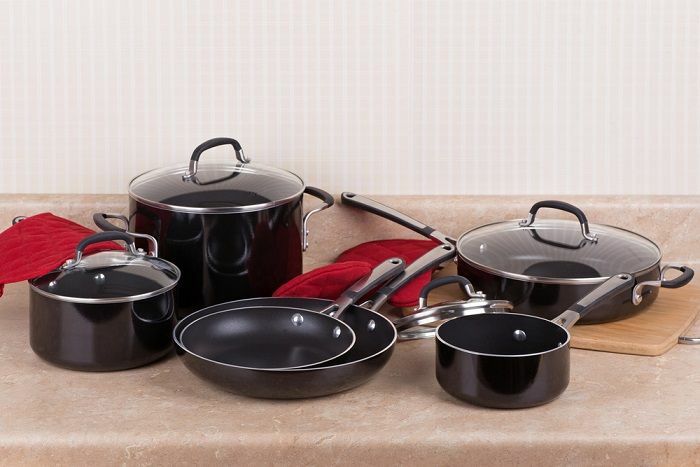 The Rachael Ray Nonstick 10 Piece Cookware Set is the best-selling hard-anodized cookware set. It’s made of hard anodized aluminum – an anode electrode is passed through it to increase the oxide coating on the outside of the aluminum – this makes the aluminum resistant to corrosion and wear and tear. The anodizing process is what produces the lovely graphite look to the pans pictured left. 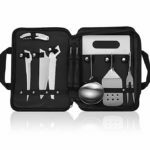 This cookware set has a nonstick interior, and the handles are made from stainless steel that is wrapped in orange silicone that is cool to touch. 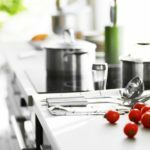 The lids are glass – safe for cooking and they allow you to watch the food as it cooks. In other words, the ten pieces consist of six pans and four lids. The pans including the handles, are safe in ovens up to 400 F. They come with a limited lifetime warranty as long as you only cook on a low to medium heat, and you don’t wash them in a dishwasher. However, washing by hand is not a problem as long as you make sure you soak the pans first in soapy water to soften any food stuck to the pan. Then use mild dish soap and a gentle sponge to clean. They advise you not to use on a glass or ceramic stove top. It is recommended that you cook with a wooden, plastic or silicone spoon to preserve the nonstick interior (don’t use metal). This 10 piece cookware set is considerably cheaper than equivalent sets being sold by other brands. Please note that this Rachael Rat set is made in China. 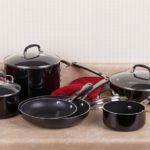 You can cook pretty much anything with the pans included in this set, making it perfect for someone who is just setting up house and wants a versatile range of pans. 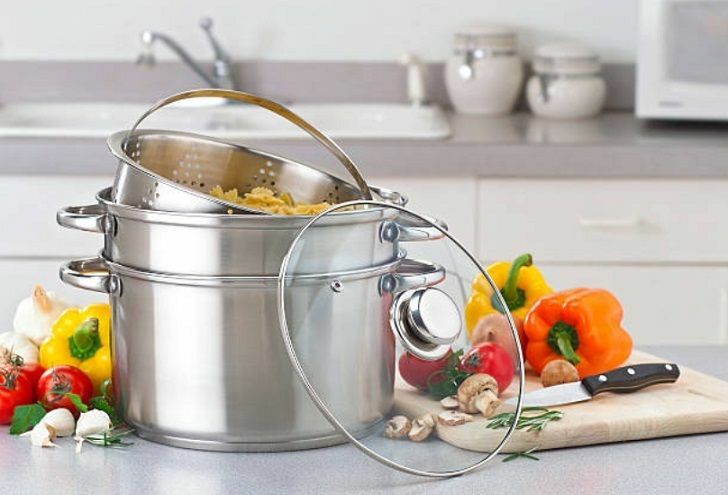 The stockpot can be used to make large quantities of pasta (it’s sometimes referred to as a “pasta pan”) or winter stews, the small skillet is perfect for cooking eggs in, and the saucepans are the correct size for cooking vegetables.